Ready in 2 mins. Gluten free. Free from artificial colours, flavours and preservatives. 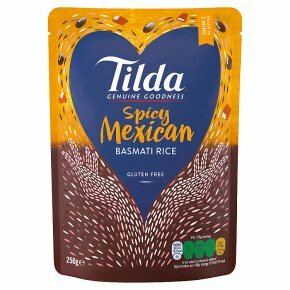 Suitable for vegetarians & vegans.Hot chilli, sweet tomato, smoky paprika & moreish beans combine for a spicy Mexican rice feast! Recipe Idea: Perfect with a sharing bake or your favourite chilli. Or Simply fill your wraps with rice, avocado and peppers. Serve with authentic chipotle sauce for a kick! Squeeze pouch, tear strip, microwave 800W 2 minsMicrowave ovens may vary. Adjust cooking time accordingly. Stir fry for 3 minsServe & enjoy.